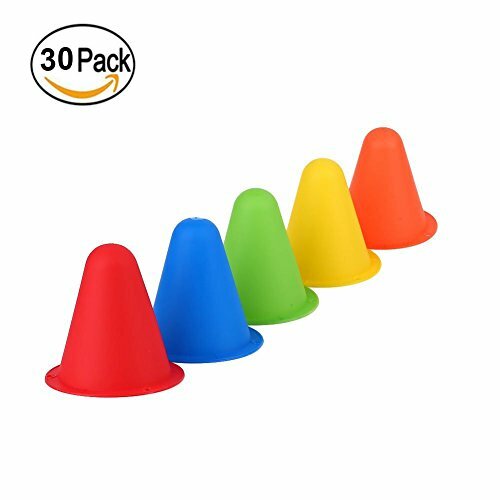 DURABLE CONSTRUCTION: Crafted of thick polyethylene vinyl plastic will ensure that these cones will have durability and stability. MULTI PURPOSE: Ideal for sports training, outdoor games or construction themed birthday party decorations. Designed for use on any surface - grass, concrete, gym floors, cement, artificial turf and more. HIGHLY VISIBLE: Comes in a variety of bright colors making them very visible and easily distinguishable on most surfaces and backgrounds. STABILITY HOLES: Each cone comes perforated at the base with 4 holes giving the ability to tie them down or stake them into the grass. PACKAGE INCLUDES: Set of 30, 6 in green, 6 in yellow, 6 in orange, 6 in red,6 in blue.